This is a list of programs that do not participate in the NRMP match. The data was compiled from FREIDA and tabulated based on states and specialties. I have excluded army, naval and armed forces medical programs from this list. They can be viewed in table later in the article. This list is for information only, please cross check your sources prior to application. Rest of the denotes programs that are variations on the standard ERAS and NRMP match process. These programs have declared that they do not either go through ERAS or NRMP. I am pretty sure this must not be an exclusive condition but quite a few programs are armed forces programs so they may be doing just that. 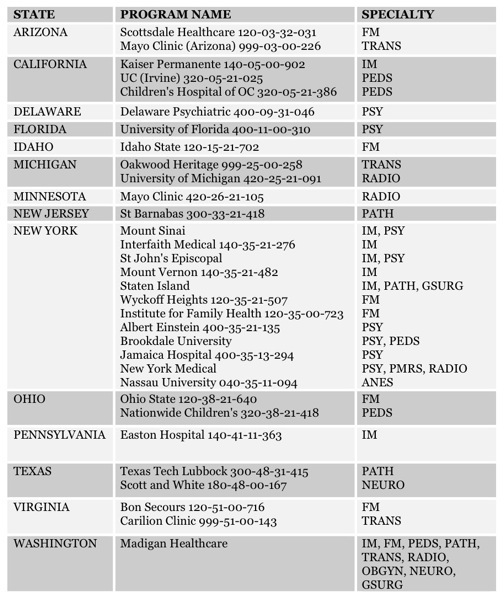 Listed below are programs that do not participate in ERAS. What is the implication of this? firstly, you may have to get in touch with the programs individually to apply for residency. They may have their own criteria for selection of applicants which may be very similar to programs that do participate in ERAS. Remember, ERAS was made to streamline and facilitate application to residencies to many places. Imagine if there was no ERAS you would have to send your CV and photo and scores individually to each of the 100+ so places!. So ERAS is actually a boon for applicants but at the same time there may be places that opt for a more individualized approach. Then there are also programs that participate in ERAS but do not participate in NRMP. This is going to a obsolete thing in the near future because as news has it, the days of prematches are soon over. But there is a caveat, a program could still in spots after the match day post scramble independent of the match, they could just be filling in for a residency spot that they lost (due to resident leaving the program for what so ever reason). In any case, the list was complied from American medical association (AMA) FREDA website for more details about the programs and program numbers etc. check the AMA-FREIDA site here. The programs in blue are regular programs while ones in black are armed forces programs.